I don't see many mice in my near future. At least not scampering free. Our cat search yesterday afternoon was a success, which is amazing considering there was one type of cat that we were looking for that we thought might work with Sadie's allergy (and that we might actually find in a shelter). We were searching shelters for a Russian Blue, because Russian Blue's produce much less of the enzyme in their spit that most people with cat allergies are allergic to (or something like that, I just could not find the article I was reading a few months ago that talked about it), but after driving an hour to see a Russian Blue that was supposed to be in a not-so-nearby shelter and finding him gone, we were discouraged. We went by Petsmart and a worker there gave us directions to another shelter where we found not only a Russian Blue, but a Russian Blue who jumped up on Sadie's lap and cuddled with her while she didn't have her typical non-stop-sneezing-watery-eyes-can-hardly-breath-through-her-sniffles-reaction. 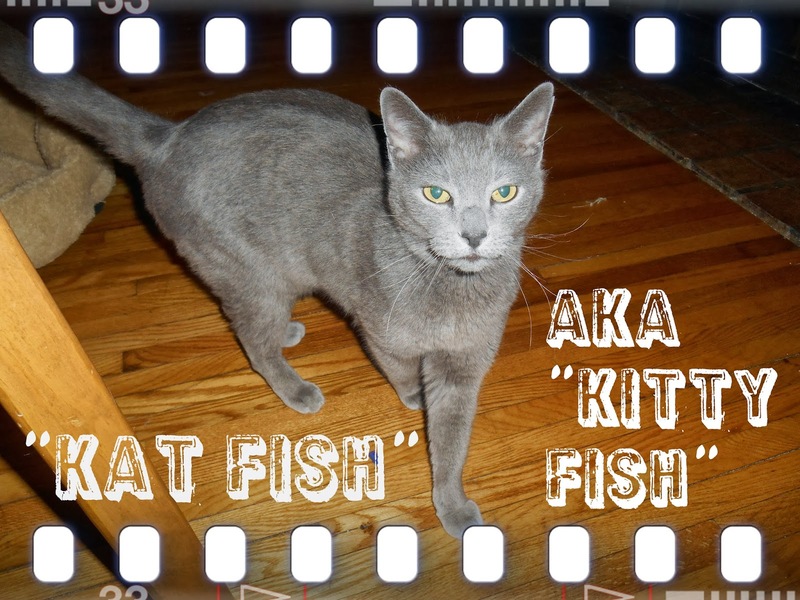 So Paul quickly paid the adoption fee and we whisked "Kat Fish" home. He came with the name and Sadie loved it, although she almost immediately began calling him "Kitty Fish" and "Fishy" as she rambled on non-stop about him. He explored the house for hours after Maggie and Patrick were tucked in bed and any questions I had about whether or not he'd be interested in chasing mice have vanished. He's does regular checks on all the vents (which I've thought is the mouse super highway) and even squeezed under the couch to check and make sure they weren't under there. He can definitely smell them and has done some stalking and holding very still, although he hasn't gotten any yet. But I also stayed downstairs much, much later than I've dared do in a while, and I didn't see or even hear a mouse last night so... our first night was a success. I'm not too worried about any mousy presents. After all, we've tried various traps (including super expensive poison) and I've been tripping over dead mice for three months... although apparently they reproduce so quickly there are always more. Up until the last few years I've had cats my entire life (I believe Kitty Fish is #13), so I actually have received plenty of Kitty Gifts (they were indoor-outdoor cats, although Kitty Fish won't be, so the gifts I received growing up included bats, snakes, mice, birds and an insane number of extremely ill tempered alligator lizards who almost always crawled up into couches to die), and have a fairly good idea of what we're getting into. I'd hoped to postpone getting a cat until we owned our own place but... the mice... they've declared war. Before Sadie went to bed she and Kitty Fish tore around the house together with him following her closely, practically attached to her heel. They even played on the ground together, which was hilarious to watch. I'm not sure I've ever met such a good natured cat. And when Patrick started to cry Kitty Fish tore upstairs and stood by his door until I got there and then followed me downstairs and sat next to Patch while he nursed. He wouldn't even eat the food I gave him until I brought it into the room so he could eat it next to me after I realized that he stopped eating and followed me every time I left the room. During the night when I'd get up with Patrick he'd come running from whatever he'd been doing and walk with me to and from Patrick's room and lay in the bed while Patrick nursed and then walked back with me while I put him in his crib. It's like having a little furry guard cat keeping me company wherever I go. And who knows? Even if he isn't great at catching mice I'm sure his presence as he runs from room to room with be a deterrent! I have a feeling I won't be running into them over and over again anymore and at very least they shouldn't be strolling into the room in the middle of the day anytime soon! Congratulations on finding what seems to be the perfect cat! Happy hunting Kat Fish! How wonderful, this does seem like the perfect cat for you! What a great thing for the kids to have a pet. I wish so much we had a pet, but hubby is insistent that he doesn't want to with all the asthma we have in the family (4/4 people.....). Sigh...but I still want to try! How does Mae like the new furry friend? Sounds like the "purrfect" addition to your home! Is Mae thrilled also? Handsome kitty. We have 3 cats and have seen no mice now. We have a female version of Kat Fish. She is a wonderful cat. I'm glad Sadie is doing fine with him. Oh wow! This cat sounds AMAZING! And idea how old he is? What I love most: that he jumped into Sadie's arms upon meeting her; that he patrolled the house like he knows his business; that he responds to urgent things like babies crying and makes it his business to follow through that everything is okay. I've always had cats too. My last cat was a little like Kat Fish. If I stubbed my toe in the kitchen and yelled "OW!" he'd come running. One time he came to me with an urgent look on his face, then went the basement door, came over to me quickly and stared, then went back to the basement door, looked at me intensely, then back over to me. So I went to see what was wrong in the basement, and it turns out the hot water heater had busted and water was pouring onto the floor. What a smart animal he was. He was my favorite "boy." He lived to be 17, and my heart still misses him. So Kat Fish sounds like a wonderful, wonderful animal. And he sounds like he wants to be a part of your family right off the bat! I pray no one else gets allergy symptoms or anything else. Hee, hee - those meeces never will know what hit 'em. So glad this seems to be a good move! We had cats, a momma and one of her kittens, for many years (I think momma cat lived to be 18.) They had very distinct personalities and were a fixture in the family while our girls were little. We had to eventually put them to sleep, several years apart, and it was so traumatic that I vowed to have another pet only if it were both potty trained (I hate litter boxes) and immortal. Don't think it's going to happen. DH is a softie and satisfies his pet craving by feeding a couple of neighborhood cats. That's as close as he's getting. Just saw your Facebook post with Kat Fish on your back. Not like somebody already feels right at home! :-) Cool cat! Any meeces news?